Thermal Insulation has been delivering professionally installed insulation solutions for commercial and industrial customers in the Southeast since 1989. We’ve built our business by making life easier for our clients. 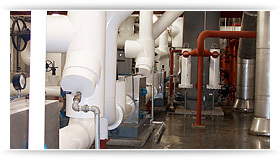 With experience in automotive, data center, food processing, governmental, medical, chemical, petroleum, power, industrial, educational and correctional projects of all sizes and costs, Thermal Insulation has the expertise, experience and talent to manage any insulation project of any size, scope or complexity. Thermal Insulation is managed by insulation professionals with hands-on experience directing projects of the widest range of sophistication and cost from Oklahoma to the U.S. Virgin Islands to Washington D.C.. The corporate team is joined by branch managers in offices in Florida and Georgia for coordinated project planning and direction. D. Gray Hughes has been an employee of Thermal Insulation since 1989. Beginning as an estimator, he has been a project manager, general manager, vice president and executive vice president. Gray was promoted to president in May 2007. With overall responsibility for corporate direction, policies and profitability, Gray’s primary emphasis is on developing customer relationships, increasing sales, directing branch managers and monitoring project execution. Gray is a graduate of the University of Alabama with a degree in small business management and entrepreneurship. Brent White started work with Thermal Insulation in 1989 as one of the first field insulators. He advanced steadily and has held positions as mechanic, foreman, superintendent, estimator, project manager, senior project manager and vice president of contracting. He was named corporate vice president in 2001. Brent is responsible for project managers, vendor relationships, estimating and cost controls. He majored in mechanical engineering at the University of Alabama at Huntsville. Greg Stephenson has been with Thermal Insulation since 1999 working in finance and administration. As CFO, Greg oversees the accounting, insurance management, asset management, payroll, and accounts payable and receivable for the company. He earned his degree in accounting from Auburn University.